Janet featured on the Good Food Ireland Blog today. Check out the article here. Janet Drew’s love for all things Country Fayre started in the mid 1990’s, at the time Janet could be found creating a delicious dish or two in her own kitchen. Fast forward to 2003 and Janet was making a living through creating 100% Irish, natural and handmade products under the name of Janet’s Country Fayre. At present, Janet’s chutneys, relishes, pasta and pizza sauces are amongst the most recognisable goods in Irish shops and the popularity of the brand continues to grow. When and how do you begin your working day? My day begins just before 6am. Tilly the dog gets fed and then a quick check on the ponies. I have two shetlands, a donkey and my nephew’s horse. I’m not a breakfast person, which probably dates back to when we were kids and had ponies. But I do try to start with some lemon and hot water which is supposed to be really good for cleansing the system. Then I head off for the day. I either turn left out the gate for Kilcoole and our production kitchen or right on to the N11 and a day on the road, doing either sales calls or meetings. Where did you get your passion for food? My passion began with both my mother and grandmother. My mother preserved and made her own lemon curd. Then I went to work with Pepe Nugent at Ballinlough Castle where I started Janet’s Country Fayre. Pepe is an incredibly good cook and a really knowledgeable person around preserving. Her damson cheese is quite legendary! She’s 80 this year and she’s very ‘old school’ when it comes to preserving. She taught me everything. What gives you the most satisfaction from your job? I love being in a shop where my products are sold and seeing a customer with one of my products in their shopping basket. I recently saw one lady with three of my products in her shopping basket so I tapped her on the shoulder and introduced myself! It’s so nice to be able to connect with the people who buy my products. I also love working on new product development in the kitchen, on my own when staff have gone home and I can run amok with ideas! Which part of the job do you like like the least? There’s nothing in particular I don’t like about being in the kitchen. What I least like is invariably something I am not good at. That’s where better skilled colleagues come in and assist me. What Advice would you give to someone looking to get involved in a food business? Be passionate but also very realistic. Do the business plan, get experienced advice and do the maths to ensure that all your costs add up. Most importantly, you must factor into your costs to pay yourself!! Also, as passionate as you might be about the product you are producing, ask yourself is there a market out there for such a product. If you weren’t a food producer, what else would you like to be? I would possibly return to my original career in the world of art history. When I graduated from Trinity College Dublin in 1982 with a degree in Art History and Classics, in the depths of one of Ireland’s recessions, my late father had hopefully anticipated that I might work in his business – The Packaging Centre on the Naas Road in Dublin. However I secured a job as PA to the Director of the National Gallery. Now all these years later, I purchase all my glass jars from the Packaging Centre, as do so many other GFI producers. One of those coincidences in life I suppose ?! Other than working in art, I’d probably also like to be a professional gardener. Pass! I so appreciate the instantaneousness of modern technology – email / mobile phone / text / social media. So amazing, but as my late father predicted years ago, technology will take over the world but nothing will ever replace two people face to face doing business. And technology is only as good as the people using it. But I fully understand how important social media in particular is to promoting your business. What are the Daily challenges of your job? For me, it’s ensuring the business progresses profitably with all my team on board. And ensuring that our reputation at Janet’s Country Fayre is as good as every jar of product that leaves Kilcoole. It’s a competitive market place out there and our hard won reputation is integral to me – probably exactly the same for all GFI members, whatever part of the food industry they work in. I always think I am only as good as my last jar of chutney. When you do something different, people always notice and they will tell you! It’s a delicate balance for anyone self employed. I’m lucky because I live on a farm with a bit of land so I have space to unwind from work. I often adopt rescue animals. As I said I have shetland ponies. They look little and cute but they are incredibly strong and they need manners! How do you Relax when you get time off? Working in my garden. Weeding is a great de-stresser!! And just being out in the fresh air I find energising. I went back to having horses a few years ago. Horses had always been an integral part of growing up. Now I have this amazing pony who came out of a rescue mare I took in during 2010. He is showing huge showjumping ability, so every last penny is saved to afford him! Food shopping in Bologna!! A friend painstakingly restored a very old house in the foothills above Bologna, where she also runs a cookery school, Casa Lara. It has spectacular views. So when I get the call to say Ryanair have a cheap weekend flight to Bologna and I am on her guest list – I am gone! What’s your favourite Good Food Ireland place to visit? I am totally unbiased!! 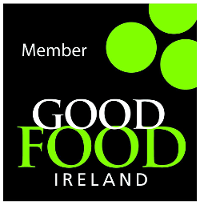 Any place you go within the Good Food Ireland membership is always a fantastic experience. Each member is totally unique. In general, I especially like to go to places that take my product. It’s nice to support those who have supported me.